New this year: A chance to win a vacation with Interval International! Visit www.robmillisorwalk.com for all event information. Helping others was the true passion of Rob Millisor, one of the owner/developers of Breckenridge Grand Vacations (BGV). In October of 2015, Rob was on a humanitarian trip to the earthquake-stricken area of Langtang, Nepal, when he suffered a heart attack and sadly passed away. Rob was very physically fit and unaware of any health issues. In honor of Rob, BGV Gives (BGV’s philanthropic program) will host their third annual family-friendly walk/run on June 8, 2019, to raise funds in support of heart health programs, education, and research. Both a 5k trail route and a 1-mile town route will be offered to walk participants. With the support from Breckenridge Grand Vacations, 100% of every dollar received at this event will be contributed to The Rob Millisor Heart Health Fund at The Summit Foundation to support heart health programs, education and research. 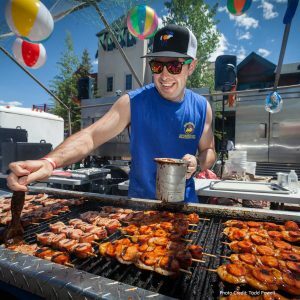 Enjoy live music, amazing Barbecue and the many festivities of the Frisco BBQ Challenge. Join us as Frisco welcomes BBQers from around the country for a FREE event kick off concert. Alcoholic beverages (no BBQ until Friday) will be available for purchase. Outside alcohol and pets are prohibited at this concert. Only cash and credit cards will be accepted at Thursday’s concert. Hogbacks will NOT be sold or accepted at Thursday’s concert. Please note that the BBQ Challenge is a no pet event.